UK Foreign Secretary Philip Hammond has said in an interview that placing American nuclear warheads on British territory is not ruled out - but it would have to be "a very delicate act." There have been "some worrying signs of stepping up levels of activity both by Russian forces and by Russian-controlled separatist forces” in Ukraine, Hammond told the BBC's Andrew Marr. What Hammond is particularly worried about is Russia's "asymmetric warfare doctrine," which he says, includes alleged use of "deniable proxies" and the stationing of missiles in the coastal exclave of Kaliningrad between Poland and Lithuania. According to Hammond, Russia needs to get "a clear signal" that "we will not allow them to transgress our red lines." Asked whether he thinks stationing US nuclear weapons would be that signal, he said: "It could be, but I think we have got a very delicate act to perform here." Despite all its alleged aggression, Russia according to Hammond has "a sense of being surrounded and under attack," and he would not want "to make unnecessary provocations." In any case, UK hosting US nukes remains a distant prospect so far, as the foreign secretary said he hasn't seen "a detailed case for it." 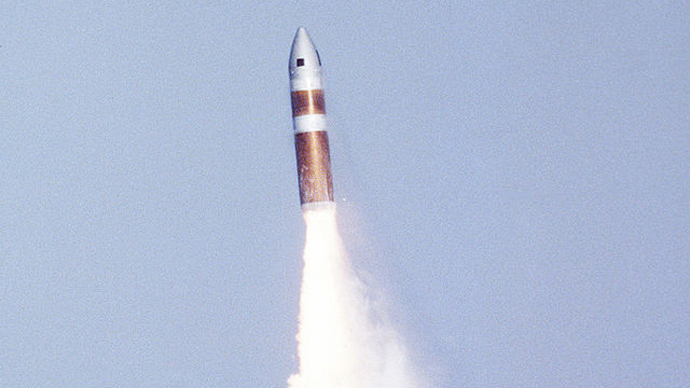 The UK has its own nuclear arsenal in the Trident program. It comprises about 200 warheads based on several submarines stationed at a base in Scotland. Recent plans to modernize the arsenal have been met with mass protests. Moscow warned that possible redeployment of US nuclear cruise missiles to Europe would only add to existing tensions, instead of increasing America's security. It is accusing Washington of violating the 1987 INF treaty and waging an information war in an effort to discredit Russia at all costs.